SAUBLE BEACH, Ont. – August 22, 2017 – Andrew Gresel led 80 laps and dominated the back half of the second-annual Outlaw Super Late Model Gold Rush 100 at Flamboro Speedway to score the $5,000 winner’s payday for the second straight year. It was only Gresel’s second night this season behind the wheel of the London Recreational Racing/CUSW/Gallinger Ford No.81 Ford Fusion Super Late Model. Gresel time trialed fifth-quickest of the 21 cars in attendance, but held the fourth starting position after American Tyler Roahrig surrendered the pole to start at the rear of the field. Gresel quickly moved up into third position and made a pass for second just before a lap 20 caution that put him in prime position on the following restart. 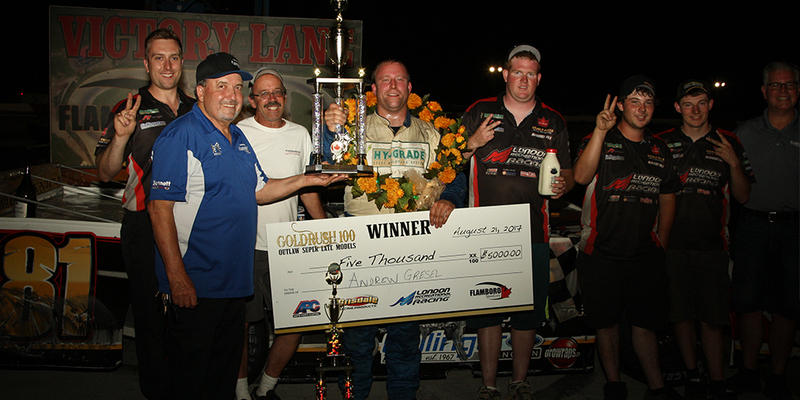 Andrew Gresel celebrates his $5,000 Gold Rush 100 victory on Monday night at Flamboro Speedway. (Photo by Dave Franks Photography). Gresel used the restart to power around the outside of Pete Shepherd III and take the lead. He never looked back from there and paced the remaining 80 laps to score the win. While Gresel was successful in getting to the front early, he was surprised at the pace over the first 20 laps. After running the first 20 laps behind the leaders and amongst lapped traffic, Gresel felt his car improve immediately when he was able to race in clean air after taking the lead. The big event victory is a major confidence boost for Gresel and his Sauble Falls Racing team heading into another big event, the Rankin Construction Late Model Summer Shootout at Jukasa Motor Speedway next weekend. Twin 75-lap Features are scheduled for the APC United Late Model Series and 75 laps for Outlaw Super Late Models. Gresel is set to tackle all 225 laps. Qualifying will take place on Saturday, August 26 before a pair of APC United Late Model Series 75-lap Features and a 75-lap Outlaw Super Late Model event on Sunday, August 27. For additional information, visit www.jukasamotorspeedway.com. Andrew Gresel and the Sauble Falls Racing team are proud to partner with several dedicated marketing partners for the 2017 race season, including McRobert Fuels, Sauble Falls Tent & Trailer Park, CUSW – Canadian Union of Skilled Workers, Hy-Grade Roofing, London Recreational, Gallinger Ford Lincoln, F1 Freight Systems, Ron O’Brien Remax, Barry’s Construction and Raden Givari at Ehomes.